January's Paper Pumpkin kit is called "Be Mine Valentine." It's intended to be 24 pillow boxes you can fill with treats and decorate using the enclosed stamp set and cut outs. Here I used the cut outs and those cute enamel hearts to decorate my Valentine Jelly Belly beans. I added my own Calypso Coral bow. I love all the bright colors together! I didn't want to make pillow boxes this year, so I took the boxes (they arrive flat in the it) and cut off the curved ends and made a card front background. Then I added the cute kangaroo holding a heart. Again I chose bright Granny Apple Green Organdy ribbon, which I earned *free* from the Sale-A-Bration brochure with my $50 purchase. My Core Group at Bible study are the lucky recipients of these sweet treats with colorful characters! I hope you enjoyed my projects today. Please leave me a comment - I love to read them all! 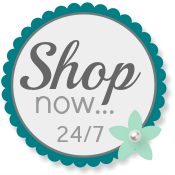 Use my Online Store any time you want to purchase Stampin' Up! products.